Have your kids ever asked you what life was like for people the Stone Age? What did they eat? What kind of houses did they have? The Pfahlbau Museum in Unteruhldingen, along the banks of Lake Constance in Germany, tries to give visitors answers – while encouraging them to ask more. What I liked about the museum, especially for kids, is that they explain how their displays and reconstructions were pieced together through discovery, through people asking questions, and then literally digging to find the answers. Translated from German, Pfahlbau means lake dwelling. 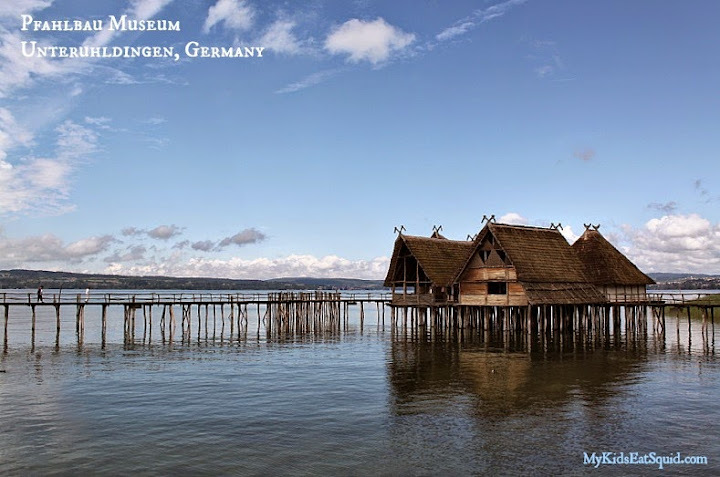 As archeologists combed the banks of Lake Constance for evidence of its earliest inhabitants they found wooden piles (poles) dug into the lake’s shores. Through research, they began to create a picture of what the structures looked like and found artifacts indicating how the people lived. 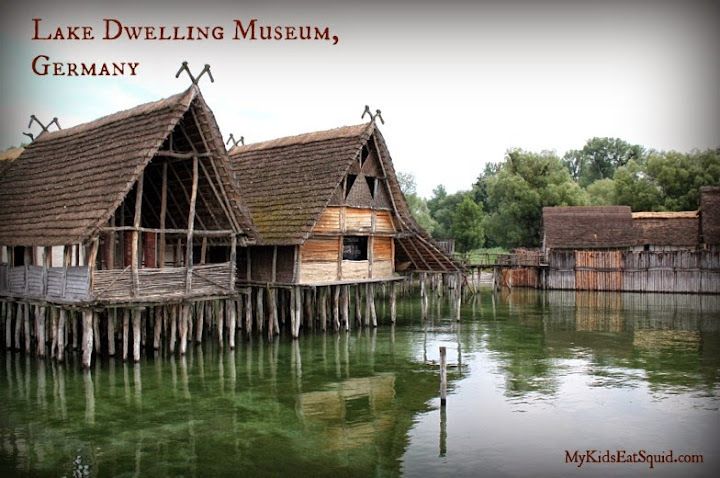 Evidence of lake dwellings, and their inhabitants, dot Lake Constance and other European countries from France, Switzerland, Latvia, Lithuania, Spain, and others. To start the tour, you step into the shoes of an archeologist: First, you hear the voices of two researchers talking back and forth discussing their questions about the early lake dwellers – you’re standing in their research lab listening in. 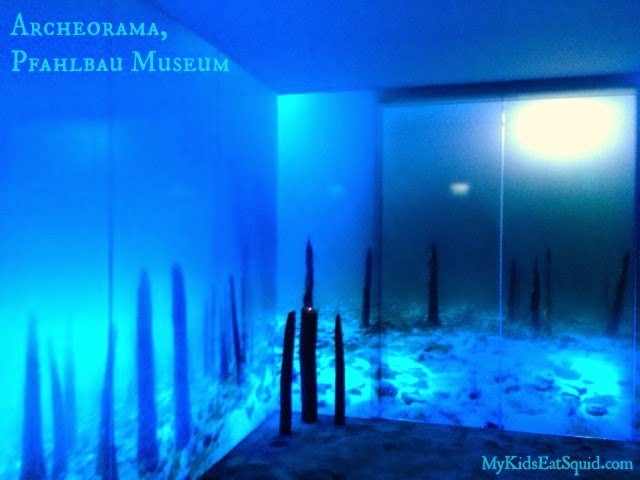 Then you walk into a room with carpet fashioned to look like ripples in water and screens all around that make you feel as though you’re on the bottom of the lake watching as the researchers swim by in scuba gear looking for the answers to their questions (the museum has dubbed the room an Archeorama). Then you’re invited to step outside and walk the wooden bridges into the reconstructed village of the lake dwellers of long ago. The expansive open-air museum includes 23 pile dwellings, representing structures dating from 4,000 to 850 B.C., both the Stone Age and the Bronze Age. Each structure illustrates a different part of the lake dwellers everyday life from a fisherman’s house to a potter’s house to a weaver’s house and more. 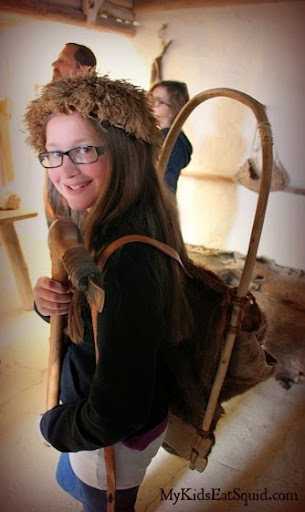 My kids kept commenting on how the lives of those in ancient times didn’t seem to differ dramatically from their own – families lived in houses together and everyone chipped in to help with various tasks. Granted, there where no Bronze Age iPhone-like devices or Stone Age TVs to be found. 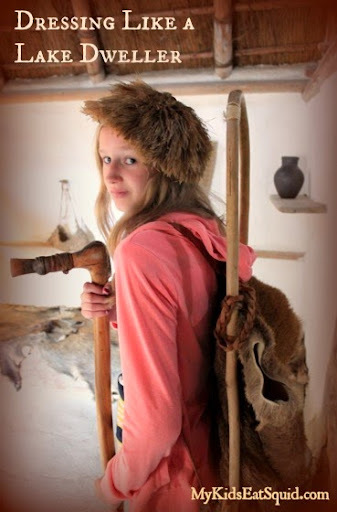 But my kids were impressed with what they did find – backpacks, hair combs and accessories along with jewelry you could wear today and feel stylish (although their thick straw hats would be a fashion no-no). I was drawn to the kitchen, with its dome-like oven and dried herbs hanging above it. The guide pointed out that the people relied on grains and made with it a cereal mash and bread. But they also had nuts and berries on the menu (they dried fruits, too) and there’s evidence they had milk and cheese. Of course, living on the lake, fish was a staple and researches have found nets, fishing poles, and other artifacts showing their reliance on seafood. The museum has informational signs throughout in German with English translations. Many of the displays, however, require little explanation – your kids will have no trouble figuring what’s depicted in the homes, sometimes with life-size figures, others times with pictures or recreated artifacts. 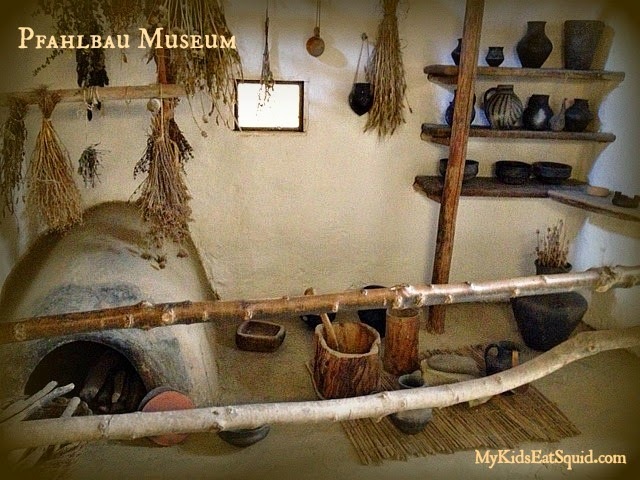 You can take a virtual tour of Pfahlbau Museum online with your kids to learn more about each building and to sneak a peek of what life might have been like circa 4,000 B.C.